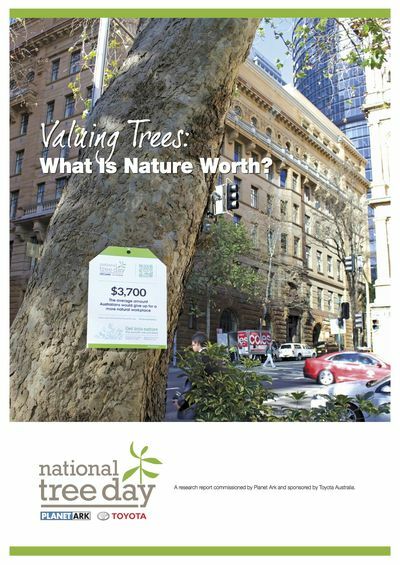 Valuing Trees: What is Nature Worth? Planet Ark's 2014 research, sponsored by Toyota, highlights the financial, health and well-being, social, and environmental benefits of nature at home, in the workplace, and at school. Parents consider green school grounds to be just as important as good academic outcomes and reputation for the kid’s school. It also found that having plants in and around the workplace and classroom helps: reduce sick leave and stress; boosts productivity and creativity; and filters and cleans the air. Valuing Trees builds upon previous research commissioned by Planet Ark that highlighted the importance of contact with nature for children’s health, well-being and development.